↑ Simpson, Douglas (1963-11-30). "Sir Daniel Wilson and the Prehistoric Annals of Scotland, A Centennial Study". Proceedings of the Society, 1963-1964. http://ads.ahds.ac.uk/catalogue/adsdata/PSAS_2002/pdf/vol_096/96_001_008.pdf। আহৰণ কৰা হৈছে: 2009-02-22. ↑ Wilson, Daniel (1851). The archaeology and prehistoric annals of Scotland. পৃষ্ঠা. xiv. ↑ The Prehistory of Iberia: Debating Early Social Stratification and the State edited by María Cruz Berrocal, Leonardo García Sanjuán, Antonio Gilman. Pg 36. ↑ Historical Archaeology: Back from the Edge. Edited by Pedro Paulo A. Funari, Martin Hall, Sian Jones. Pg 8. ↑ Through the Ages in Palestinian Archaeology: An Introductory Handbook. By Walter E. Ras. Pg 49. ↑ Graslund, Bo. 1987. The birth of prehistoric chronology. Cambridge:Cambridge University Press. ↑ The Essence of Anthropology 3rd ed. By William A. Haviland, Harald E. L. Prins, Dana Walrath, Bunny McBrid. Pg 83. ↑ Race and Human Evolution. By Milford H. Wolpoff. Pg 348. ↑ Vanishing Voices : The Extinction of the World's Languages. By Daniel Nettle, Suzanne Romaine Merton Professor of English Language University of Oxford. Pg 102-103. ↑ Douglas John McConnell (2003). The Forest Farms of Kandy: And Other Gardens of Complete Design. পৃষ্ঠা. 1. ISBN 9780754609582. http://books.google.co.uk/books?id=QYBSfUJPQXcC&lpg=PP1&dq=the%20forest%20farms%20of%20kandy%20and%20other%20gardens%20of%20complete%20design&pg=PA1#v=onepage&q&f=false. ↑ Mumford, Lewis. The City In History Its Origins, Its Transformations, and Its Prospects. New York: A Harvest Book Harcourt, Inc, 1961. Print. ↑ Ziomkowski, Robert. The Best Test Preparation for the Western Civilization. New Jersey: Research & Educational Association, 2006. E book. ↑ Shea, J. J. 2003. Neanderthals, competition and the origin of modern human behaviour in the Levant. Evolutionary Anthropology 12: 173-187. ↑ "Mount Toba Eruption - Ancient Humans Unscathed, Study Claims". http://anthropology.net/2007/07/06/mount-toba-eruption-ancient-humans-unscathed-study-claims/। আহৰণ কৰা হৈছে: 2008-04-20. ↑ 22.0 22.1 This is indicated by the M130 marker in the Y chromosome. "Traces of a Distant Past," by Gary Stix, Scientific American, July 2008, pages 56-63. ↑ Gene S. Stuart, "Ice Age Hunters: Artists in Hidden Cages." In Mysteries of the Ancient World, a publication of the National Geographic Society, 1979. Pages 11-18. ↑ Stuart, Gene S. (1979). "Ice Age Hunters: Artists in Hidden Cages". Mysteries of the Ancient World. National Geographic Society. পৃষ্ঠা. 19. ↑ Encyclopedia Americana, 2003 edition, volume 6, page 334. ↑ Stuart, Gene S. (1979). "Ice Age Hunters: Artists in Hidden Cages". Mysteries of the Ancient World. National Geographic Society. পৃষ্ঠা. 8–10. ↑ "No-Till: The Quiet Revolution," by David Huggins and John Reganold, Scientific American, July 2008, pages 70-77. ↑ Glassner, Jean-Jacques. The Invention of Cuneiform: Writing In Sumer. Trans.Zainab,Bahrani. Baltimore: The Johns Hopkins University Press, 2003. Ebook. 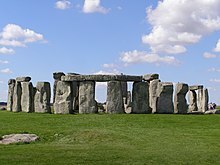 ↑ Caroline Alexander, "Stonehenge," National Geographic, June 2008.